Last month, I mentioned that 2017 is all about paying our customer debt by launching as many features from our top wishlist items as we can this year. We are now very close to our next major software update, coming by the end of March: Wild Apricot Version 5.10. I’m happy to let you know that this release will give you the ability to schedule email blasts, something many of you have been waiting patiently for. Along with this emailing feature, you’ll see a host of other upgrades, such as a Not attending button for your event announcements, the ability to automatically suspend overdue memberships, the ability for recurring members to update their credit cards, and more. Full details below. On another note, you may have noticed that we have brought back our free expert webinar series. The next one is coming up tomorrow, from database expert Wes Trochlil on how to use data to achieve your mission. And in March, we are hosting two webinars, instead of just one. On March 14, membership program expert Joy Duling will show you how to keep members forever. On March 28, Rick Lent and Nancy Settle-Murphy, two leading experts on meetings, will reveal how successful leaders run virtual meetings that actually get work done. By the end of March our latest update — Wild Apricot Version 5.10 — will include the long awaited Scheduled E-mail Blasts feature. It has been a top voted WA forum idea for a while and now it’s ready to be released. This is the initial release of this feature, which will evolve based on client feedback. So bear in mind that we will monitor usage closely and improve the functionality in the upcoming releases. Now, you can set up an email in advance to be delivered to a contact or a saved contact list on X date at X time. Scheduled blasts will appear in the list of Emails (formerly Drafts) and stay there up until the moment of delivery. To edit a previously scheduled email click the Pause button, to prevent it from being sent, and convert it to an editable draft. The emails in the list are arranged by the “last modified” criterion. But if you filter them to view scheduled only, the emails will be arranged by delivery date and time, with the most recent at the top. This allows you to check the order and the schedule of your outgoing emails quickly and easily. 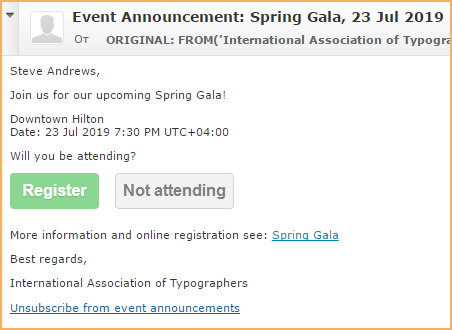 With Version 5.10, you’ll be able to include a macro in your event announcements to display a Not attending button, so that invitees can exclude themselves from future announcements for the current event. 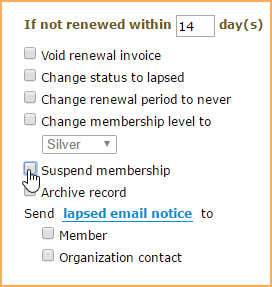 As part of the renewal policy for your membership levels, you’ll be able to automatically suspend members if they don't renew their membership within a certain number of days. Previously, when members needed to change their credit card information for recurring membership fees, they had to stop the recurring payment, then renew their membership with the new credit card details. Now, members paying via PayPal Payflow Pro, Authorize.Net, Moneris, or Stripe will be able to change their credit card information from their member profile. Administrators can update credit card information for members paying via PayPal Payflow Pro, Authorize.Net, Moneris, or Stripe from the Membership tab of the member's contact record. Previously, new members could register for events using member-only registration types before their membership was paid for. With 5.10, you can prevent new unpaid members from registering for events using member-only registration types simply by enabling the Payment has to be received in full before membership is activated option on the New applications tab for the membership levels you choose. Previously, registration types without a registration fee appeared on various registration screens as Free, and registration types without a registration fee but with extra cost fields appeared as Variable. Now, registration types without a fixed price will appear without any cost or label. Previously, different areas in admin view shared the same URL. As a result, you couldn't bookmark a particular area, or share a link to that area. Now, each area in admin view is identified by a unique URL, allowing you to bookmark the area or share a link to it. You can even bookmark individual pages or page templates since they are uniquely identified by a page number. For more information on the upcoming 5.10 release, click here. Is your membership database a mess? Nine out of ten organizations don't use their databases properly. That's why we're hosting a free webinar tomorrow, Tuesday, Feb 28, with top database expert Wes Trochlil, who will show us how the most successful nonprofits use their database to achieve their mission. Sign up now and we'll see you tomorrow, February 28 at 2:00 PM (ET) / 11:00 AM (PT). March 14 with Joy Duling — The 8 Step Formula For Keeping Members Forever. Sign up here. March 28 with Rick Lent and Nancy Settle-Murphy — Leading Great Virtual Meetings That Actually Get Work Done. Sign up here. My "wish list" includes a fully-functional on-line store, comparable to Godaddy's. We're currently in something of a bind, having to support membership sales on one product, and product sales (like T-shirts and other member wear) on another. This seems like an obvious place where Wild Apricot could do better. I still need to print invoices once a month to mail them out. Can we please, please, please have a batch print button for open balance invoices? Thank you for your continued improvement and excellent customer service! RE: Wishlist item: RSVP. It was my understanding that this update would include not only a "not attending" option but a one (1) click Registration. I don't see any mention of this. It remains a highly desirable option for members when they are already in the database and are attending a free event. The registration process is too complex and certainly unnecessary . Hi Keith. We're treating the Not attending feature as a separate feature from RSVP, which will include one-click registration. I can't commit to a timeline on the RSVP feature but I can say we are currently working on it, and It's on our list of features we hope to deliver in 2017. Thank you for this I'm pleased to see that 'free' will no longer appear alongside FOC events. Could you do the same for Member types which are free? Will you ever be upgrading features for your events module to help manage more complex events like Conferences and Tradeshows? Specifically to handle exhibit booth sales & management, speaker profiles where they can upload their bio and headshot to populate within a conference page the speakers profiles, , program, venue, event sponsorships and tie in annual sponsorship to an event .. The registration system is very basic. There are so many variables that are needed with event registration and management. 1. Early-Bird, Pre-registration, On-Site. There is no options to set price by date to auto change on the cut-off dates. 2. Exhibit Booths: Each exhibitor is entitled to x amount of free conference registrations & exhibit hall passes. this is standard protocol for 99% of tradeshow management. There is no way to set the limit on the number of "guests" they can register under their registration for the booth, There is no way to provide a certain number of free exhibit hall only registrations. There is no where to manage any of this. 3. Annual Sponsors: there is no way to tie in annual sponsorships to an event. It goes through your donation module which does not produce an invoice either just a confirmation. Annual sponsors get free booths to the tradeshows depending on their level. All this has to be managed outside the AMS creating a lot of work for the admin. They have a slew of benefits depending on their level of participation. Some get advertising but there is no where to track ads in the system. Should be a place they submit or upload their file. A place we as admins can keep track and manage all our sponsors, advertisers, exhibitors and run separate reports. All this has to be followed up individually with each sponsor and exhibitor and tracked separately outside the system. Requiring many many hours of additional work for the admin. 4. the event page set and system page should be better displayed for admin and the user. Should be more viewable space other than the little description box. The system template should provide a cleaner page where all parts are distributed evenly on the page for a more professional on-line presence. As it now, all the registration options to the many different ways to come to event (attendee member by all the different levels of membership, non-member registrations by type of company, exhibitors, additional exhibitor staff, 8 or 9 event sponsor options, etc are all jumbled together on the side of the page and it looks messy and not easy to read to the user. 5. Would like to be able to change the verbiage on the donation registration. We do not accept donations but do have annual sponsorships. May actually be a violation to call it donation if you are not a 501c3 and collect against it in some states. 6. Will you ever be getting more current themes? more so in lines of wix, weebly, responsive full page type of themes with more professional business colors and layouts to stay current in todays web presence? Any thoughts of moving into a drag-and-drop website builder? Any thoughts on adding some popular apps and widgets? Please, share your thoughts there. All development teams, including event module development team, and me personally are constantly watching all ideas and comments there, ask questions if needed and follow up on suggestions.